Stunning 4K video and beautiful photos at depths as great as 200' are yours, thanks to the Ikelite DLM200 Underwater Housing with TTL Circuitry and Sony Alpha a6500 Camera Body Kit from B&H. 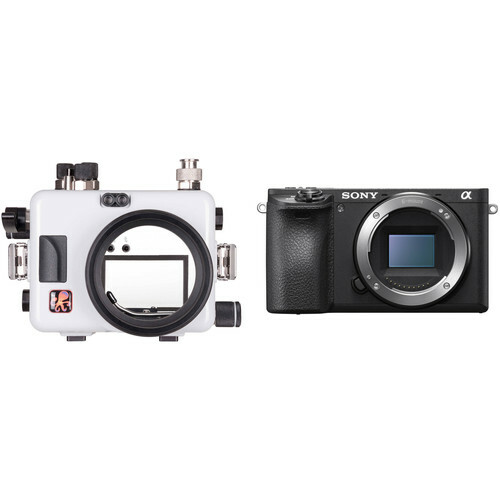 Bundling the durable waterproof enclosure with the 24MP, APS-C mirrorless digital camera, this package gets you well on your way to a photo or video adventure beneath the surface. Once you grab your favorite lens, the appropriate port, and a strobe or video light, you'll be ready to start your dive. Capture sharp, detailed photos and video at depths as great as 200' beneath the surface, thanks to Ikelite's DLM200 Underwater Housing with TTL Circuitry for your Sony Alpha a6500 Mirrorless Camera. An Ikelite 5-pin sync bulkhead and integrated TTL circuitry enable the connection of optional, external strobes. Ikelite DS flash units can be used in TTL or manual exposure mode, while third-party strobes will work in manual mode. Ergonomic mechanical controls, including push-buttons, knurled knobs/dials, and levers, afford access to virtually all camera functions. Built for durability, the enclosure is made in the USA from a corrosion-resistant polycarbonate and ABS plastic blend. It is light gray/white on the front, top, sides, and bottom, but clear in the back to allow you to monitor the O-ring seal and maintain your view of the camera's rear controls. An optional aluminum tray with a quick-release grip handle or two will afford improved balance and handling, while offering a way to attach optional lighting arms. The housing ships without a required lens port, and accepts various, interchangeable dome and flat ports for a broad array of zoom, macro, and wide-angle lenses. For full compatibility, see the DLM Port Chart. Box Dimensions (LxWxH) 9.7 x 6.4 x 6.4"